Theophilos became a reference for the artists of the Generation of the ‘30s, who, in their quest to redefine Greek identity, posthumously ‘discovered’ the artist. 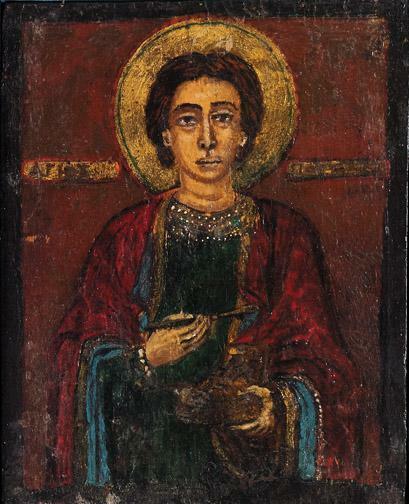 St Panteleimon has affinities with a few other of Theophilos’ religious works, such as St George, now in a private collection. Of humble origins, he left his island in 1883 and lived in Smyrna until 1897, when he returned in order to volunteer for the Greek-Turkish War. He then lived in Volos and the villages of Mount Pelion, where he made painted decorations in houses and shops; he was not accepted by the locals, due to his peculiarity as a person. In 1926/1927, disillusioned, he returned to his native island for good, where he continued to paint. A few years before his death, introduced by Fotis Kontoglou and Giorgos Gounaropoulos, he made the acquaintance of Tériade, who commissioned from him works in order to organise an exhibition in Paris (which finally took place in 1936). The effective discovery of his work by the Generation of the ’30s occurred posthumously. 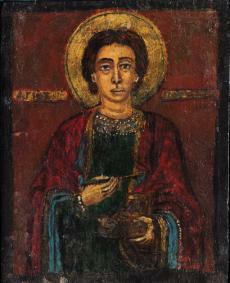 In 1964, at Tériade’s expense, the Theophilos Museum was erected in Vareia. The Yannis Kontos mansion at Anakassia, Volos, whose painted decoration, made by Theophilos in 1912, survives intact, is also known as the Theophilos Museum. In his works – wall-paintings, paintings on objects or cloth – his personal world unfolds, in which figures from legend, tradition and historyexist side by side with images from his everyday reality, captured with the authenticity, imagination and originality of folk painting.